I had a babysitter that lived next door to me when I was around 9 years old. She had long dark hair, loved the Bay City Rollers and was maybe 4 or 5 years older; all of which made her just that much more sophisticated than me. Her name was Dawn Marie and I worshipped her. Around that time, I was seriously beginning to doubt the whole Easter bunny thing. The notion of an enormous magical rabbit living in the woods somewhere, sneaking into my house in the middle of the night unnoticed, just to hide hordes of candy and chocolate for my eating pleasure, just wasn’t flying with me anymore. That Easter, Dawn Marie told me she actually saw the Easter bunny. She even described him in great detail, just as I had imagined he’d look. How could I possibly doubt her? After all, she was my idol-the wiser, older teenager that I admired so much. Dawn Marie kept me believing just that little bit longer. I guess that was part of her sophistication. There was a period of time after I stopped believing in the Easter Bunny, Santa and the rest of the gang, that my parents continued to hide Easter chocolates and write “Love Santa” on many of our Christmas gifts. We weren’t supposed to say that Santa or the Easter Bunny weren’t real or we may not get the chocolates or gifts. Their justification: how can you get chocolates and gifts from someone who isn’t real? Although the logic was obviously skewed, it was still a risk I was not willing to take. I kept my mouth shut and played along for quite some time. That Easter chocolate fix was something I required. I no longer hunt my living room for chocolate Easter eggs, but I still require that fix. And since I continue to hide them for my kids, if desperate, I can always pinch some from their loot to satisfy that craving. 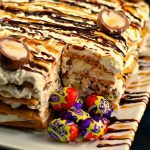 But I have recently come up with a better way to get an Easter egg fix without stealing from your kids-this Icebox Cake made from the iconic Easter cream egg! 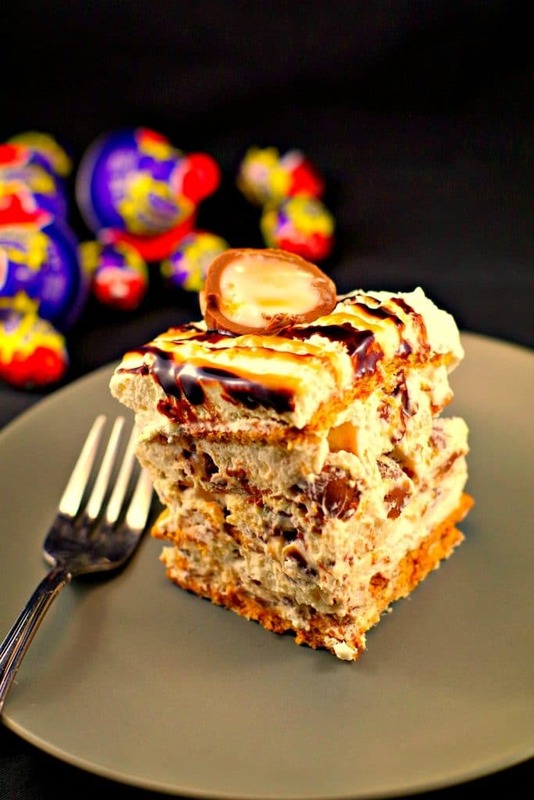 If you are like me and always struggle with what to make for Easter dessert, this Easter Creme Egg Icebox cake is the perfect easy and quick addition to your Easter dinner celebration. Although Ice box cakes are really old timey, they are coming back into fashion for a reason – they are no bake, easy, fast and delicious! Interestingly, they actually aren’t even cakes. They just resemble cake once the whipped cream magically softens the layers of wafer cookies or crackers, just enough to make them tender and flaky, transforming into an elegant torte-like dessert. 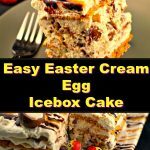 They are called Icebox cakes because back in the day, before electricity and refrigerators, this easy “cake” would be put into the icebox to set. My daughter is now 9, the same age I was when my belief began to wane, and she recently asked me some pretty tough questions about the Easter Bunny. I told her the same things I was told. And sadly, I know it won’t be long until she no longer believes. I am sure my son is long past believing but he doesn’t say anything. Like Dawn Marie, he’s a pretty wise and sophisticated pre-teen and like me, he knows very well that you can’t get chocolate or gifts from someone who isn’t real. Beat the whipping cream to soft peaks. Add the powdered sugar, vanilla, and salt with the cream in the bowl of a stand mixer (or large mixing bowl). Beat to stiff peaks. You can do this with a stand mixer, hand mixer, or whisk. Remove 1/4 of the whipped cream and set aside. Crush the Easter Cream Eggs. TERRI'S TIP: I do this by placing them on a cutting board and placing a large plastic ziplock bag over them. Then I hit each egg a couple of times gently with a hammer or mallet to crush them, with the plastic between the tool and the eggs. * This is the best and cleanest way I have come up with to crush them. If you enlist your kids to help you unwrap and crush them, it goes much faster and it's fun for them! Scrape the smashed mini cream eggs off the cutting board (and any off the plastic) with a spatula and into the remaining whipped cream. Smear just a small spoonful of plain whipped cream in the bottom of the dish. This will hold your first layer of graham crackers in place. 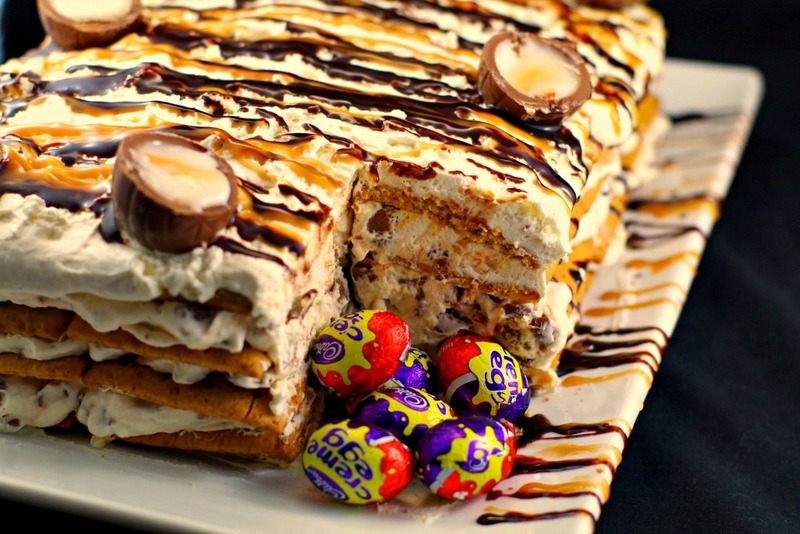 Spread 1/3 of the easter cream egg whipped cream mixture on the layer of graham crackers. Top with another full layer of crackers, again breaking some if necessary to make a layer that fits in the dish. Add another full layer of graham crackers and Easter egg whipped cream. Add a fourth layer of crackers and the remainder of cream that was set aside. Place Easter Cream Egg halves evenly on cake, as pictured. 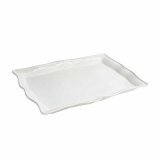 Cover loosely with plastic wrap and refrigerate for at least 2 hours or overnight, if time permits. The cake is ready when a knife inserted in the centre goes in easily and comes out with soft crumbs. * Note: When I tested this recipe on several different people, I got very mixed reviews on sweetness. About half said "too sweet" and the other half said "just perfect". I don't like too sweet and I found it just perfect. So, please feel free to adjust to your liking by adjusting the amount of icing sugar in the whipped cream. Thanks! And yes, decadent it is! 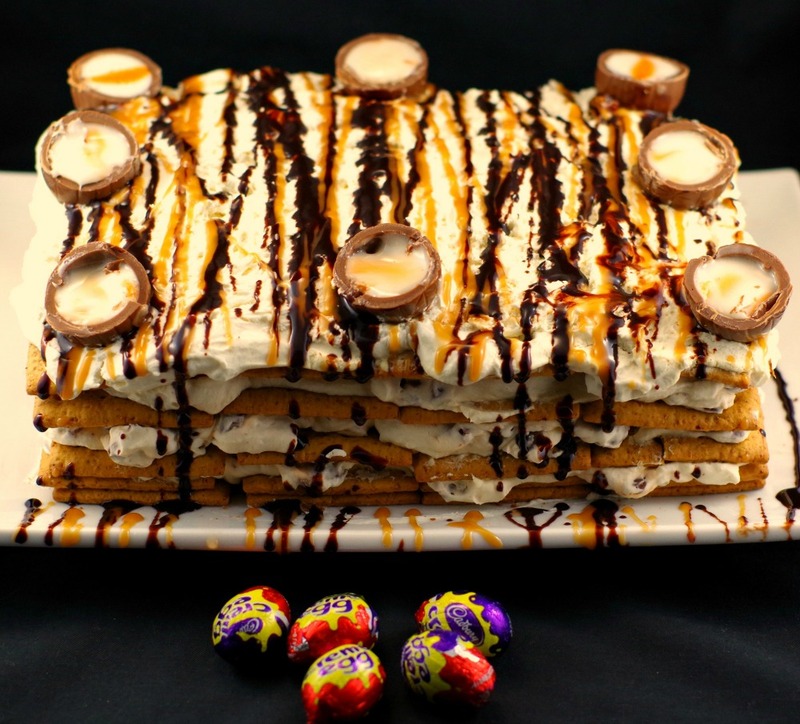 This looks delicious and would be a lovely treat to serve at Easter. I’m planning to serve an icebox cake of sorts, using pureed strawberries and coconut milk. Thanks, Amanda – your cake sounds awesome too! I love when desserts are super easy but also super delicious! Thanks for sharing! What a lovely story! I am not familiar with this Easter bunny thing for kids, in Italy we do not have that, Easter is a Catholic celebration and it holds a whole different meaning, even for kids. So I am always intrigued and pleased to learn about different traditions, and you gave a beautiful portrait. 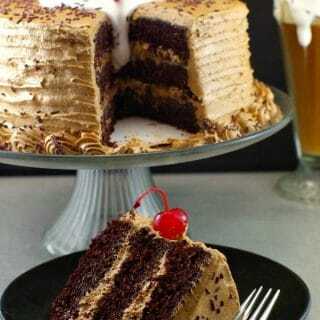 Beautiful like this icebox cake, a whole new thing to me as well (wow, lots of things I am learning! 🙂 ). It looks delicious, easy to make and so pretty to put on a table. I love this easy yummy recipe! Thanks! So glad to hear you love it!! I assembled the cake on the plate you see in the photo. You can do it in a pan (9X13) or smaller type lasagna pan. Yes, a whole box of graham crackers should be enough! Would the graham crackers be 1 box or more?